Though Martha Rosler has been working since the 1960s, her retrospective, Irrespective (until 3 March 2019) at the Jewish Museum shows how timely and timeless her new and old protest art is: she addresses gender roles, gentrification, US foreign war, police violence against people of colour, authoritarianism… subjects that might be familiar to any follower of the news today. The works—photomontages, video (Rosler was an early adopter of the medium), installation, sculpture, performance and digital photography—are both playful and acerbic. 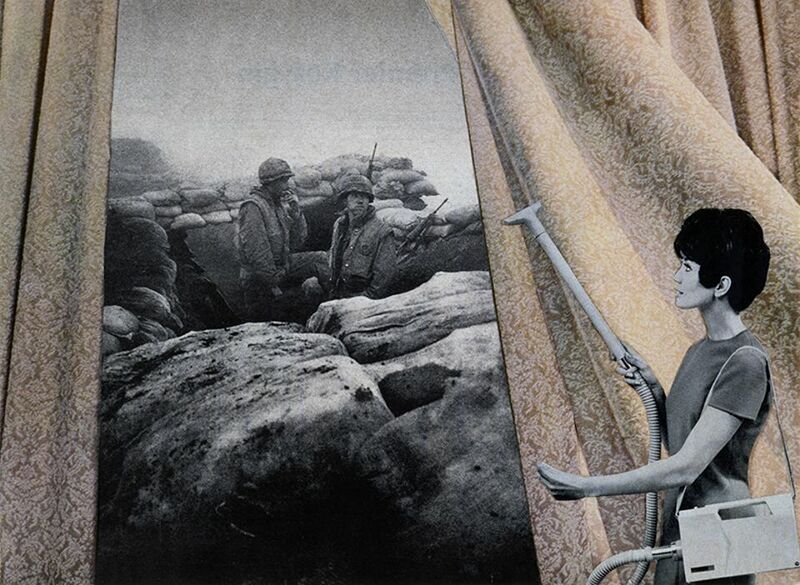 Take her anti-Vietnam War photomontage series House Beautiful: Bringing the War Home (around 1967-72), which also challenges gender roles and the American dream by splicing mass-media pictures of perfect domestic interiors and cheerful, stereotypically beautiful women with photos of war. In one, a pair of parted curtains, vacuumed by a happy beehive-sporting woman, reveals a shot of two soldiers on the front. Another juxtaposes First Lady Pat Nixon, wearing a sunny yellow dress in an elegant, yellow room, with an image of a slain woman. (Rosler Xeroxed the images and distributed them at anti-war rallies.) She made a second generation of such works, House Beautiful: Bringing the War Home, New Series (2004) focussed the Iraq War—a warning, perhaps, that history repeats itself. Do not expect to see Sol LeWitt’s monumental wall drawings at his current solo exhibition at Paula Cooper Gallery—but you won’t be disappointed. Sol LeWitt: Large Gouaches (until 15 December) instead highlights the artist’s work on paper, a constant throughout his career, with gouaches from 1992-2005. These works are not rigid grids but based on motifs like “tangled bands”, “wavy brushstrokes” or “squiggly brushstrokes”. Unlike his wall drawings, they are also executed by his own hand. They are exuberant and free, some almost dizzying to look at. Brushstrokes (1996) is a jubilant, riotous overlapping of ochre, white, black, coral-red and cerulean in a pattern that looks like a beautiful tangle of ribbons. Tangled Bands (2002), meanwhile, offers an entirely different, more meditative experience, with dark muted blue lines curving horizontally along the paper, on a brown background. Mignoni Gallery takes another path through LeWitt’s work in the exhibition Sol LeWitt: Lines in All Directions (until 9 February 2019). The show (which has a large gouache from 2003, similar to those on view at Paula Cooper) offers up the artist in a variety of media and scales. Three major bodies of work are presented: Serial Project #1 (1966)—a sprayed enamel on aluminium sculpture that echoes the geometry of the more rigid wall drawings, Wall Drawing #42 (1970) and Wall Drawing #69 (1971). But the most interesting part of the show are smaller works on paper from the 1970s-90s, such as the gouache and graphite work with four square fields on a black background, Untitled (Bands of Color in Four Directions) from 1991, about 11 inches high and 30 inches wide. There is something delightful in seeing works that resemble the wall drawings in small format, like looking at tiny, scale furniture in a dollhouse.